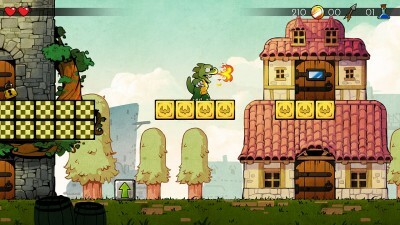 Wonder Boy III: The Dragon‘s Trap gilt als eines der ersten Metroidvanias. Der Master-System-Klassiker besticht noch heute durch schicke Grafik und gute Spielbarkeit. Das Team von Lizardcube aus Frankreich nimmt sich jetzt des Spiels an, um ihn im zeitgemäßen Gewand wieder zu beleben. Wir haben uns mit Projektleiter Omar Cornut über das Comeback des alten SEGA-Helden nach 22 Jahren unterhalten. neXGam: Hello. Please introduce yourself first. Omar: Hi, I am Omar Cornut. Been programming and making games for a while now (worked on Soul Bubbles, Pixeljunk Shooter, Tearaway among other things). At Lizardcube we started doing a remake of our favorite childhood game Wonder Boy III: The Dragon’s Trap. Ben Fiquet is doing all the art and animation. Michel Geyre is rearranging, composing music and working with the different instrumentalists. Romain Gauthier is creating the audio landscape and sound effects. And more recently Sebastien Ronsse joined us and is helping with programming and reverse engineering. neXGam: How did you get the idea to do a Wonder Boy game? And why did you choose The Dragon's Trap? Omar: Well it’s been 25+ years that we first played the original games, and we love the series the much.. That’s what we grew up with. We thought it was the right time to make a generous, loving remake of our favorite episode. I think The Dragon’s Trap would be enjoyable by all sorts of players, not only people who grew up with it. It has cool characters, it’s easy to get used to the controls and it has so much depth and exploration. But it also has such a fan base, it helps keeping us on our toe because we can’t afford to mess it up! neXGam: There have been no Wonder Boy games in 22 years. Is SEGA in any way involved, and how did you manage to get the rights? Wonder Boy rights seem to be quite convoluted. The name and characters were SEGA's, but Westone nevertheless licensed the gameplay and level designs to several other companies, so Wonder Boy games appeared under numerous names on different platforms. Did you consider going the route of a different name too if you had not acquired the Wonder Boy name? Omar: Yes, to be honest when we started just Ben and me, we had no hope of even acquiring the rights to use the name. We were happy already that Nishizawa-san and LAT gave us the blessing and the right to reuse the gameplay and designs, and we were ready to give another title to the game! But eventually the project grew better and better, and we secured DotEmu as a publisher. They’re used to deal licenses with big Japanese publishers and we knew they had the backbone and go ask SEGA for it and find the right way to unblock the situation directly in Japan. Mind you, even with DotEmu and LAT doing lots of the negotiation it took almost a year of talking to get it..
neXGam: One game that does go the route of a different name is Monster Boy and the Cursed Kingdom. I hear you are friends with the developers, as they are also from France. Was Wonder Boy very popular in France back in the day? Omar: The Master System was reasonably popular in Europe, compared to Japan or the USA. In France, Germany and United Kingdom it seems like it performed decently - so of course for the kids who had a SEGA, the Wonder Boy series was highly regarded. Wonder Boy in Monsterland and The Dragon’s Trap on the Master System, then Monster World on the Mega Drive. I knew David the lead programmer of Monster Boy from school. We played Wonder Boy games together quite a bit. 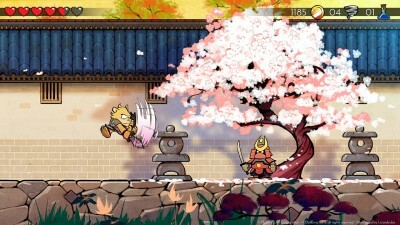 neXGam: Nishizawa-san has been very supportive of the new Wonder Boy projects in public. Is he in any way helping with development? Omar: We showed him the game a few times, and of course he approved the early proposal and visual researches. He gives us feedback here and there, and was always very supportive. 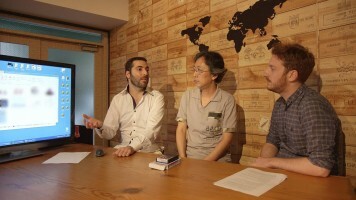 We started talking with him about this specific project since 2013. He isn’t hands-on with day to day development, because he can’t! He’s been working full time on his own game Yuba no Shirushi for mobiles in Japan for a long while now. Echt? Na dann ists wirklich besser als die Asia.